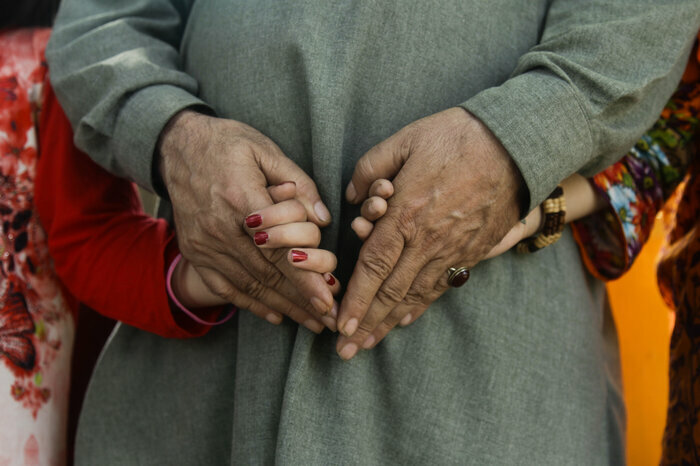 Mir, a Pakistani man who used to live in Xinjiang, China, clutches the hands of his two daughters. Since Chinese authorities detained his wife, he's been raising their two girls alone. "My mind just won't work," he says. "I sound incoherent, I can't think, I even forget what to say in my prayers." But after she landed in China's northwestern region of Xinjiang, she was detained, says her husband, a doctor named Rehman. His wife is a Uighur Muslim, a member of a minority group that has been targeted in a Chinese crackdown. Security officials left their sons at their grandmother's house. Weeks later, they returned and took away the older boy, age 6. The security officials "admitted him to a Chinese orphanage school," says Rehman. From what he's understood, the orphanage is meant to raise the children in Chinese culture. "They don't want the children to have Pakistani or Uighur customs. They want the children to become Chinese," he says. "It's not a normal school. They teach them, they feed them, but they don't allow the children to see their parents." Rehman hasn't heard from his wife or older son since he took them to the airport in Pakistan in July. "It's a very difficult time," he says, pursing his lips and holding back tears. "My family has been broken." For decades, there have been marriages and business ties between Pakistanis and Uighurs from China's Muslim-majority Xinjiang Uighur Autonomous Region. All that has been shattered by China's crackdown on its Uighur minority. NPR spoke with six men whose Uighur wives have been taken away in the past year and a half. NPR is withholding full names and identifying details of most of the men because they fear for their family members' security in China. 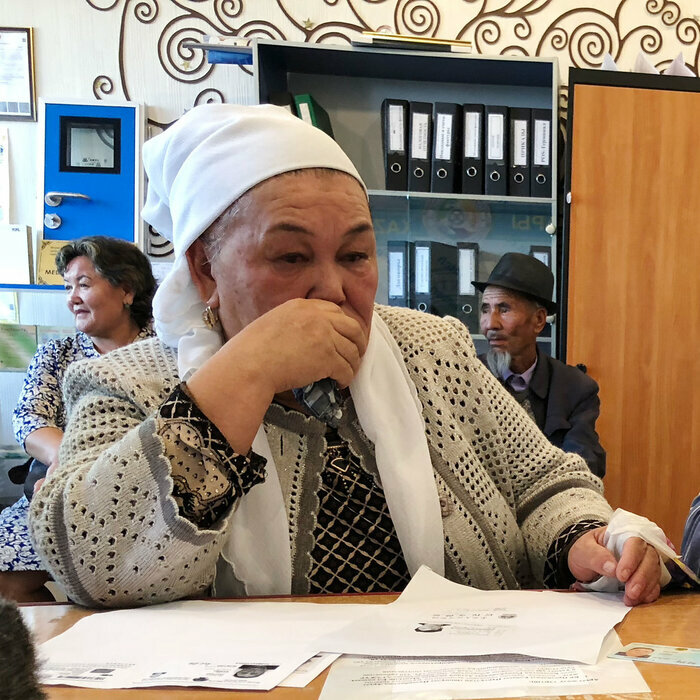 Rehman's wife is one of at least dozens, perhaps hundreds, of Uighur wives of Pakistani men who have disappeared since April 2017 into China's internment camps, according to estimates by their spouses. It is unclear how many children of such unions have also been seized. 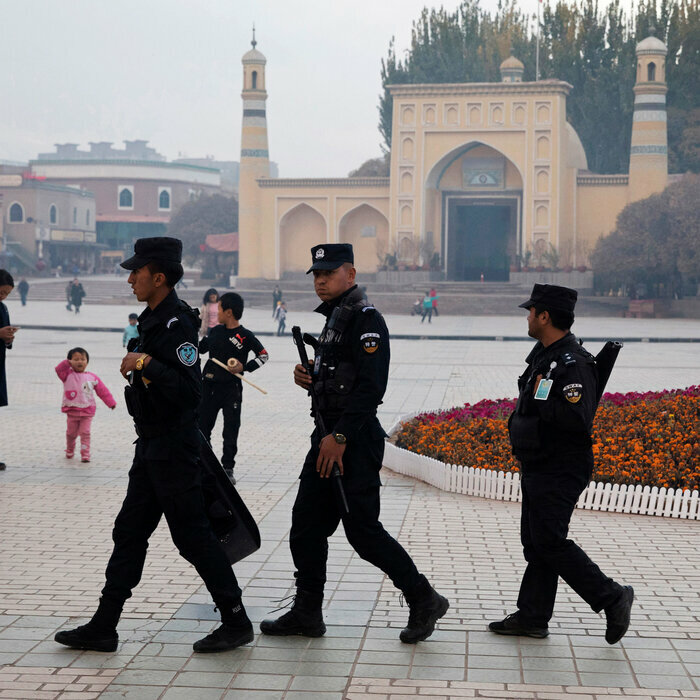 Rights groups estimate as many as 1 million Uighurs and other minorities are detained in these camps, with the aim of stripping away their ethnic identity, suppressing their Islamic faith and ensuring their loyalty to China. The Pakistani men initially hoped quiet lobbying to Pakistani officials in Islamabad and at the Pakistani Embassy in Beijing would free their families. But seeing no change after more than a year of effort, they began speaking out to Pakistani and international media in recent months, hoping that greater attention would lead to the release of their wives. 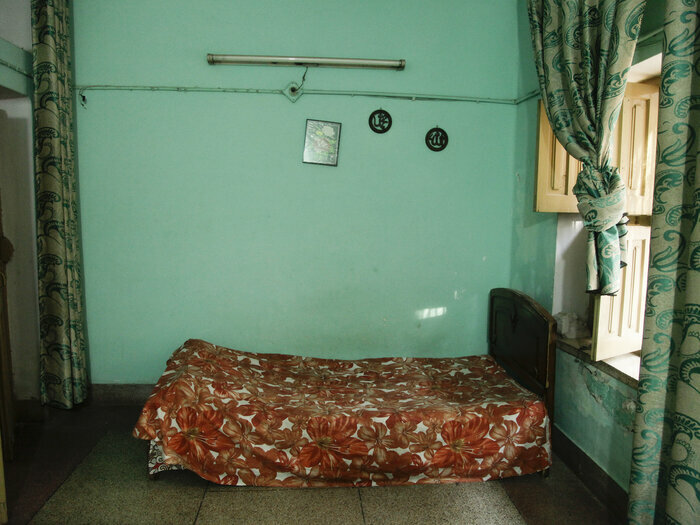 Hameed, a 39-year-old clothing exporter, spends time in this room at home in Pakistan, unable to renew his visa to China. His Uighur wife was detained in January. Hameed says his wife was caring for her mother, who died while she was in detention. His wife was released for six hours for her mother's funeral, guarded by two female security officials, and then was returned to her camp. They are also prompted by a new fear: that their children, trapped in China, risk being taken away to state-run orphanages. The children are vulnerable because many of them are Chinese citizens. Many of the Pakistani men did not naturalize their children. They believed that before the crackdown, there was no need. Now, they say, Chinese authorities are not allowing the children to leave the country — and are taking them away on the pretext that their parents are not present. 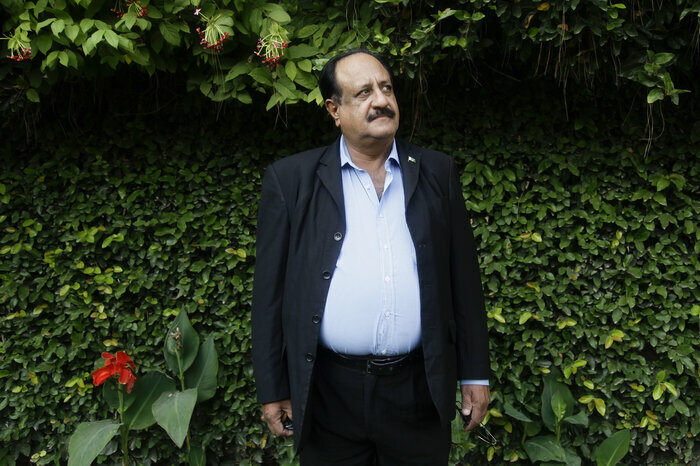 "Children whose mothers and fathers aren't present — they take them to orphanages," says Javeid, a 62-year-old Pakistani businessman who says his wife was seized last October. His two sons are Chinese nationals and they are being raised for now by his wife's siblings. "I am worried, I am worried." Despite a close, seven-decade relationship, Pakistan appears reluctant to push the matter with China. Pakistan is deeply vulnerable. It is seeking a bailout from the International Monetary Fund to avert economic collapse. Pakistani Prime Minister Imran Khan traveled to Beijing in early November to seek China's assistance and request billions of dollars in aid. China has already loaned Pakistan about $2 billion to stabilize foreign currency reserves. Pakistan is also a key recipient of loans from China's sprawling, global Belt and Road Initiative, with investments in infrastructure and energy projects worth more than $60 billion. "It's quite a delicate juncture for Pakistan, economically," says Andrew Small of the German Marshall Fund of the United States and author of The China-Pakistan Axis: Asia's New Geopolitics. There is not "going to be a huge amount of appetite to open another really difficult front with China." Underscoring those sensitivities, Pakistani officials declined to comment for this story. So did Lijian Zhao, the Chinese embassy's deputy chief of mission in Pakistan. Despite close China-Pakistan relations, the Uighur wives appear to be specifically targeted because they married Pakistanis, says Maya Wang, the China senior researcher for Human Rights Watch. A key category of Uighurs being detained are those who have had contact with citizens of 26 countries, most of which are Muslim-majority, including Pakistan, she says. Chinese officials suspect they could be influenced by their Muslim spouses. While they are abroad, they are suspected of agitating for Uighur independence, propagating Islam or aligning with militant groups, according to Chinese state media. "Spouses of Pakistanis are being detained under this kind of broad idea that 'we need to cast a wide net to catch everyone who might be susceptible to so-called extremism,' " says Wang. The Pakistani husbands insist their wives have been caught in that wide net without justification. One Pakistani man, Ilyas, a car parts trader, says his wife worked in a children's shop in a Xinjiang mall. The wife of Hameed, a clothing exporter, was caring for her disabled mother, who died after Hameed's wife was sent into detention. She was released for six hours for her mother's funeral, guarded by two female security officials, and then was returned to her camp. Rehman's wife was a stay-at-home mom. He met her while he was studying medicine in Xinjiang and says they moved to Pakistan so he could work as a doctor in a hospital. Rehman says he and his wife didn't know from Pakistan that there was a crackdown in Xinjiang. It wasn't the kind of thing that Uighurs would tell each other on heavily monitored phone lines, he says. "If I knew, she would never have gone," he laments. Their younger son has Pakistani citizenship, so after the older boy was detained, Rehman took the baby back to Pakistan, where he is being raised by Rehman's mother. Javeid says his wife was also his accountant. They have two sons and had settled in Xinjiang, running export businesses and halal restaurants. Javeid, a 62-year-old Pakistani businessman, says his Uighur wife was seized last October. His two sons are Chinese nationals and are being raised by his wife's siblings. He fears they will be taken away to an orphanage on the pretext that their parents are not present. Last year, he says, Chinese security officials began knocking on their door late at night to interrogate them every few weeks: "'When did you get married? Why did you marry?' They asked about my passport, her identity card," he says. "Who am I calling? What am I doing?" Javeid avoided praying in Xinjiang mosques, fearing Chinese security officials who had questioned him about his Muslim prayer habits. During the month of Ramadan, when Muslims fast from sunrise to sunset, the couple ate their pre-dawn meals in the dark, fearing that if their non-Muslim neighbors saw the lights on, they might report the family for fasting. "If you turn on the light, then I have a problem," Javeid recalls his wife telling him. 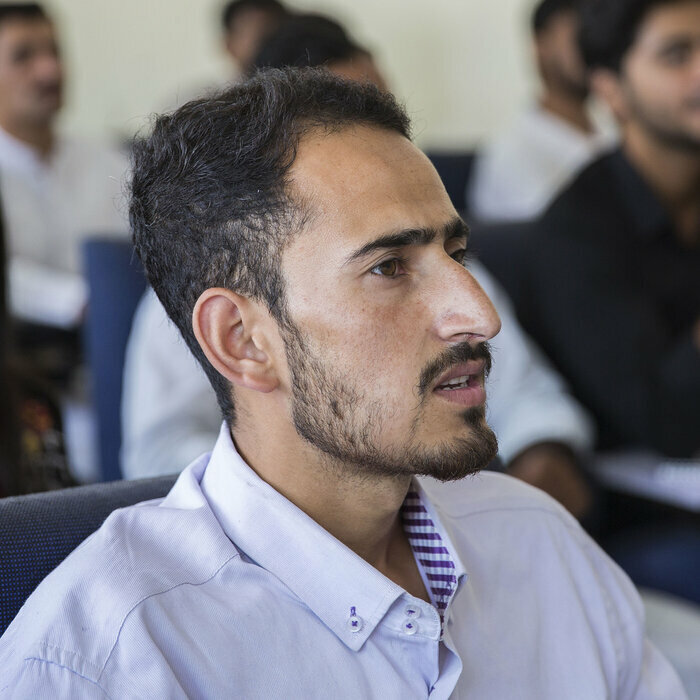 Last October, during a visit to Pakistan, Javeid received a call from his wife. She was phoning him from a police station, crying. "This may be the last time we talk," she told him. "I will not come back." She was sent to an internment camp. Their neighbors took in the children, who were later shuffled off to his wife's siblings. Javeid returned to Xinjiang, where police allowed him to call his wife from the station. "I asked her, 'What are you doing?' and she said, 'We are just singing, dancing,' " Javeid recalls — songs about the Communist Party and the Chinese leadership. They were learning Mandarin, he recalls her saying. But he says his wife already speaks fluent Mandarin. He arranged clothes for her — two pants and jackets. To comply with internment rules, a tailor replaced all the zippers with cloth ties. In Xinjiang, Javeid found it difficult to continue his businesses. He couldn't get the right permits. His mobile phone was blocked. Chinese authorities refused to renew his visa. He had to return to Pakistan. On his last day in China, in August 2017, he drove his children to school. "I told them, 'I'm going to Kashgar for business,' " he says, referring to a city in Xinjiang. "I'll come back in two weeks and I'll bring you some toys," he told them, knowing he would not be able to keep the promise. Remembering this, Javeid bursts into tears. He has never spoken to his children again. 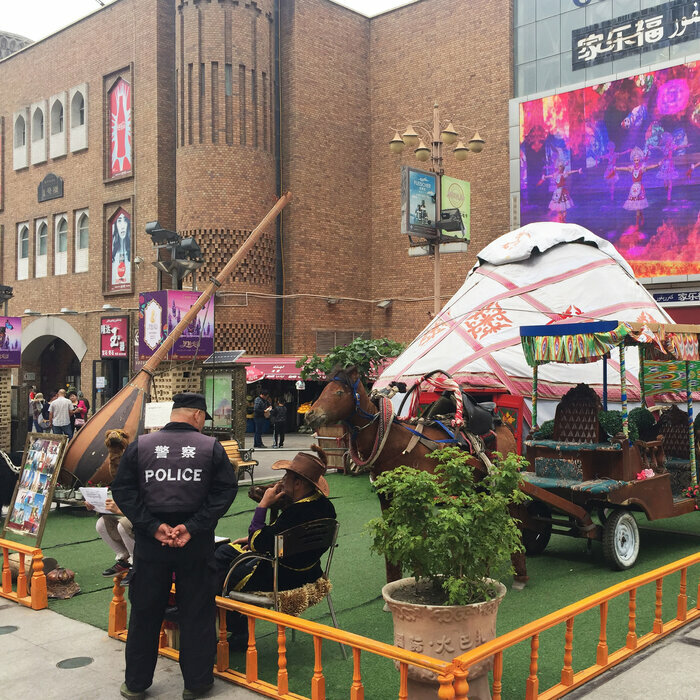 China's Uighurs can be detained if they have contact with Muslim foreigners — even their own parents — so a non-Uighur Chinese friend passes messages between Javeid and his in-laws and children. Most recently, his friend told him to send $500 to stop his children from being taken to an orphanage. Javeid wasn't sure if the money was a bribe. "You can't ask too many questions," he says. As a Pakistani, he was helpless, he says. He paid up. "China is an elephant," he says. "Pakistan is the ant."